The fruit and vegetable market has suffered small losses due to the growth of nonindustrial backyard production. A new report by government analysts studies the impact of Russia’s embargo on Western food imports and decreasing incomes, and shows the changes in consumer spending patterns. 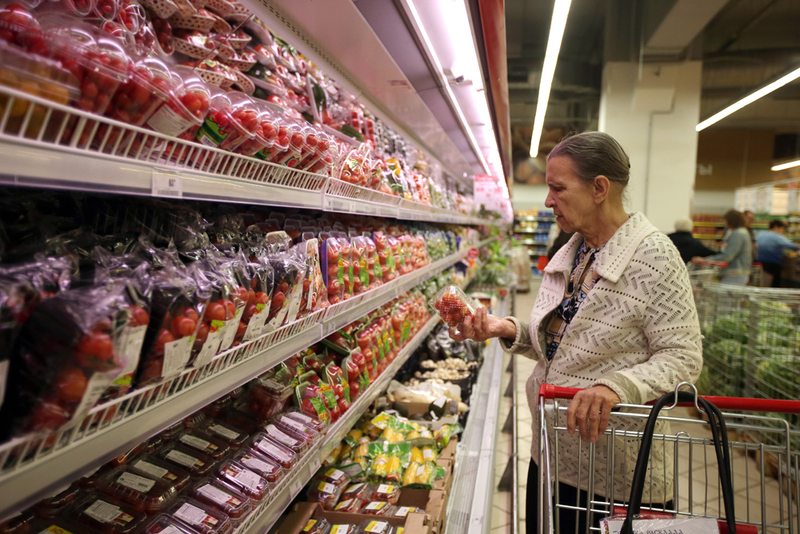 The sharp decline in the incomes of Russians, coupled with the introduction of the embargo on Western food imports in 2014, has led to a decline in the quality of consumption: Russian citizens are being forced to switch to cheaper products and spend more on food, experts from the government's analytical center have concluded. At the same time, the Russian food market as a whole has not felt the negative impact of counter sanctions: The meat, milk, vegetable and fruit markets have made a shift towards Russian producers and companies that import products from countries that do not fall under the sanctions. According to the report by the Russian government's analytical center, titled "The Food Embargo: The Results of 2015," Russia's introduction of the food embargo on the EU and the United States in August of 2014 cost supplier countries $9.3 billion. The experts say that food markets have already adapted to counter-sanctions in various ways, with a growth in domestic production helping the meat and milk market, and the fish market reorienting as less wealthy customers opt for cheaper kinds of meat. The fruit and vegetable market has suffered small losses due to the growth of nonindustrial backyard production and a partial switch to suppliers from countries that do not fall under the sanctions. At the same time, counter sanctions have led to a substantial redistribution of the Russian market. Many foreign brands and importers have quit or reduced their share, which has led to an increase in market share for large companies, the emergence of new small domestic producers, as well as an increase in the share of retail chains' own-label products. "The change of suppliers was paid for by customers via price increases, which has relatively benefited the Russian producers and trading companies, which have largely revised suppliers, as well as launched their own brands," says the report. Experts admitted a decline in the quality of consumption, including that associated with a sharp decline in real incomes (in 2015, real disposable income and the average wage in real terms decreased by 4 and 9.5 percent, respectively). "Already from 2014, the share of food products in the consumer basket resumed growth and reached 38 percent. This is much higher than the levels typical for developed countries (10-20 percent) and even some developing countries (In Brazil, food costs account for 17.8 percent), but still below many of the CIS countries (In Kazakhstan, this figure is 44.4 percent)," say the authors of the report. The report notes two trends. The first is that consumers are choosing cheaper products, such as cereals or pasta. The second is that counterfeit products, such as fake cheese, are appearing on the market. "The share of expenditure on food has risen, and the share of expenditure on non-food products has fallen," say the authors of the report. However, they do not see particularly bright prospects for Russian food producers in the event of the cancelation of counter sanctions. According to them, there are significant risks of the redistribution of share in the domestic market in favor of imported products, while the continuing downward trend in global food prices would be an obstacle to the growth of Russian exports in new markets.